Explosive energy, heightened focus and an overwhelming urge to tackle any challenge...that’s the C4 experience. Millions of people­—ranging from beginners all the way up to the elite competitors, have relied on C4 to help them turn their ambitions into achievements. As America’s #1 selling pre-workout, C4 Original lives up to its solid reputation with a classic formula for advanced energy, endurance, focus and pumps! But with a new bottle design and more delicious flavor options for you to choose from, you’ll feel like it’s your very first time experiencing the C4 you know and love. HOW DO I TAKE C4? It is recommended to take one serving of C4, mixed with 4-6 oz of water, 20-30 minutes prior to training. Once your tolerance has been assessed, you may take an additional scoop, with an additional 4-6 oz of water, 20-30 minutes prior to training. WHY DOESN’T C4 HAVE SPECIFIC CYCLING INSTRUCTIONS? When the reformulation of the Generation 4 C4 products took place, it was determined that the product did not required a specific cycle time for the product to be the most effective. However, in regards to products that contain stimulatory ingredients, we recommend to use the product for up to 8 weeks, then discontinue use for 2-4 weeks. Over time, your body could build up a tolerance for ingredients that support energy. By discontinuing use, you allow your body to reset those tolerances. HOW MANY SERVINGS OF C4 CAN I TAKE PER DAY? We recommend to not exceed 2 servings per day. If your workout schedule requires two workouts, we recommend to only use one serving of C4 per workout. To not exceed 2 servings in a 24 hour period. WHY DOES MY SKIN HAVE AN ITCHY/TINGLING FEELING AFTER TAKING C4? The C4 family of products are formulated with the amino acid Beta Alanine, which supports muscular endurance, and often has a tingling/itching effect experienced by users about 10-20 minutes after consuming the product. ARE THERE ANY FLAVORS THAT ARE NATURALLY COLORED? Yes, the Pink Lemonade flavor is naturally colored by the ingredient Beet Root. Beet Root is the root of the purple colored garden beet, and because of its vibrant color, beets are often used for natural coloring or dyes. HOW MUCH CAFFEINE DOES C4 HAVE PER SERVING? 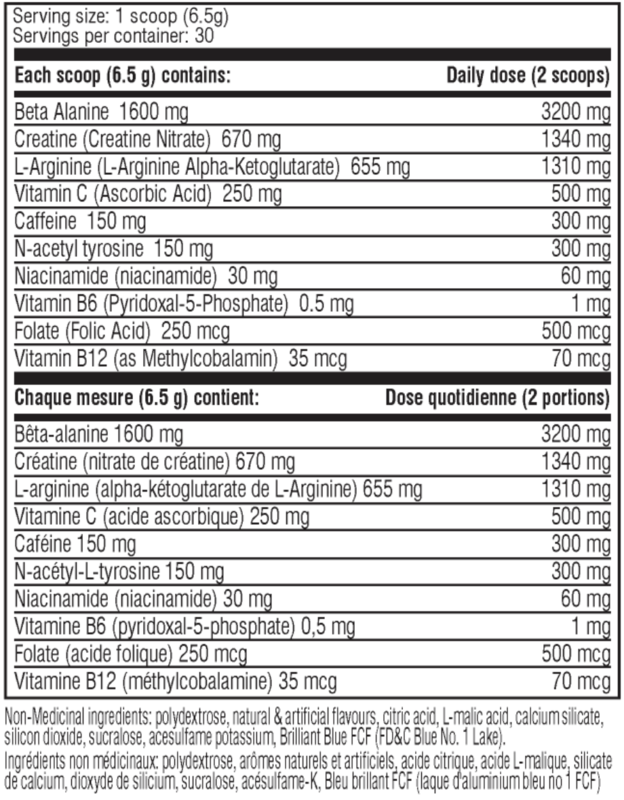 C4 contains 150mg of caffeine per serving. I AM CURRENTLY TAKING A PDE-5 MEDICATION FOR ED, WHY IS THERE A WARNING ON THE LABEL NOT TO TAKE THIS? Because of the nitrate's ability to relax the walls of the blood vessels to promote increased blood flow, nitrates are frequently included in men’s sexual health products. Taking nitrate ingredients and PDE-5 inhibitors at a similar time could cause an unsafe drop in blood pressure. Because some dietary ingredients also act as PDE inhibitors, please consult a licensed qualified health care professional before taking this product with any dietary supplement, product, or medication. WHY WAS SYNEPHRINE (ADVANTRA Z) REMOVED FROM THE GENERATION 4 C4 FORMULATION? Based on valuable feedback from our customers, we made the decision to remove that particular ingredient and modify the formulation to be even more effective than before. CAN I STACK OTHER CELLUCOR PRODUCTS WITH C4? You certainly can, however you want to make sure to not take in an excess of nitrate ingredients, nor stack stimulant based products such as pre-workout and weight loss products. One stimulant based product to be used at a time (C4 Family of products, SuperHD, D4 Thermal Shock) Products with higher concentration of nitrate based ingredients such as the C4 family, NO3, and CN3 are recommended to not be used together.